“Samdech Akkak Moha Senapadei Dekchor Hun Sen, the Prime Minister of the Kingdom of Cambodia, received Mr. Lee Sang-Sun, the president of an energy technology company from the Republic of Korea on the morning of 28 April 2008 at his house in Takhmao, Kandal. “Samdech Prime Minister’s advisor H.E Om Yentieng told reporters after the meeting that Mr. Lee Sang-Sun told Samdech Prime Minister about the projects and the study of iron minerals for which his company has received a license from the Ministry of Industry, Mines, and Energy, and he also asked Samdech Prime Minister for land concessions to facilitate investments in bio-energy. “Regarding iron mine investment, Samdech Prime Minister asked the company to continue to study cautiously before dealing with big projects, such as the creation of an iron foundry or big investments in the future. “As for the investment in energy, Samdech also encouraged and advised to check clearly the location in order that the relevant ministries, such as the Ministry of Agriculture, can check and give their opinion about which areas should be preserved [for agriculture] and which areas should be encouraged for investments. “Samdech Prime Minister also encouraged the company to check the possibility to produce bio-electricity by using rice straw, corn husks and stalks, and other waste. The first advantage would be that we get electricity for rural areas, and the second advantage would be that we can create more income for farmers from what they throw away. There was quite some reactions to the Prime Minister’s speech about the possibility of unrest in the country after the elections. And there was excitement about some statements allegedly made by the leader of the Sam Rainsy Party, that “he will take the land and property of the rich and give it to the poor” – which would lead to chaos in society. We do not intend to add directly to this debate which we mirrored already during the week, but we would rather like to draw the attention to former – different – statements by the Prime Minister about the danger of social upheaval and also chaos in society. These statements often related to land conflicts, as a consequence of the granting of economic land concessions to big agricultural or forestry businesses, or the private grabbing of land, reportedly often with the protection of armed units, which became more and more serious over the years. And such events are reported almost every week until today. “Corruption is a curse that undermines our aspirations for development, social justice and poverty reduction. The war against corruption is another set of reforms that will take time; much like the war against terrorism. The approach must be comprehensive. As for the other two reforms, Cambodia must own and lead the change. It is not only a matter of sovereignty it is a matter of practicality. It is essential to sustainability and enforcement. The adopted strategy is based on a three prone approach: prevention, law enforcement and mass support. The Administrative Reform and the Legal & Judicial Reform both contribute directly to reducing causes and opportunities for corruption. Sectoral reforms in land, natural resources, commerce and investment, revenue collection also contribute to the war against corruption. Whatever wording the leader of the opposition party may have used, the concern is similar and requires action. Too much economic injustice is not tolerable. There are, of course, other methods to consistently work to overcome the economic gap between the rich and the poor, and to collect revenue for public services – apart from controlling corrupt practices: the system of taxation. It is surprising that there is hardly any intensive discussion going on in the Khmer press about the economic models the different parties would like to see implemented – whoever gains the majority in the next round of elections for the National Assembly. Law, Tax & Good Governance requested to speed up the issuing of land titles – so that the land titles could be used as the basis to secure bank loans for the farmers. This is not surprising, as it is a forum to discuss business. The forum to discuss fundamental policy is the National Assembly, where the elected representatives bring their visions to make concrete policy towards its realization. And the media are adding the voices of the general public to the debate. It would be interesting to see a debate developing about how to structure not only law enforcement, once the Anti-Corruption Law will be finally in place, but also how taxation policy would help to gradually work towards bridging the gap between those who are rich, and the rest of the population. This is hardly questioned – but there are small, and there are also very big landholders. In many other countries, they are treated separately. This week, it was reported that Cambodia will greatly increase the tax on cigarettes in order to reduce the number of smokers and reduce the deterioration of the health of many citizens. Maybe increasing the tax on large passenger cars would not only lead to a lot of savings for the whole country in the purchase of fuel from abroad, but would also save a lot of public funds spent on cars which are definitely oversized, compared with neighboring countries. But apart from some such specific areas, there is not much evidence that the leadership of different sections of society are working to build public understanding, that an adequate taxation system has to be developed with urgency, if the public sector is to overcome its heavy dependence on international funding support. “On the morning of 25 April 2008, the Extraordinary Chambers in the Courts of Cambodia [ECCC] held a conference to release the result of the special monitoring over an accusation of corruption in the tribunal of the former Khmer Rouge leaders; it is asserted that there is no fault as had been raised in the accusation. “The United Nations Development Program [UNDP] Country Director for Cambodia Mr. Jo Scheuer, who participated in the press conference this morning, said that about a year ago, because of different irregularities and accusations, the UNDP pushed for an internal audit of the process of staff recruitments for the tribunal of former Khmer Rouge leaders, to respond to points which were considered to be weaknesses in the management of human resources. “He continued that all weak points were reviewed, in the reports and in the ongoing audits in the ECCC, and some recommendations continued to be raised to be solved. While the audit was continuing, the ECCC had already begun different measures of improvements, such as creating a staff work books and a code of ethics. “The UNDP Country Director said that in late February 2008, the UNDP hired an independent monitoring team to monitor the management of human resources. This renewed monitoring aimed to assess the management of human resources so far. Among the monitors, two were management experts from India, another team member is Khmer, an expert on human resources. The monitoring took four weeks to be finished. “The director of the Office of Administration of the ECCC, Mr. Sean Visoth, told reporters that this special monitoring was initiated by the Project Council, and it was implemented since late February 2008 by an independent expert team from the Deloitte company in India. This renewed monitoring aimed mainly to finish the reports of the previous audits of the ECCC. “Mr. Sean Visoth went on to say that the monitoring is to show clearly whether there is transparency and accountability in the management of human resources, and in the implementation of human resources policies in the ECCC, and whether these are in line with international standards, and whether or not the responses satisfy what was raised by the Project Council. The director of the Office of Administration of the ECCC said that although not everything can be done perfectly, it had been possible to achieve what had been intended. Mr. Sean Visoth claimed that more than US$100,000 was spent on the monitoring team. “The European Community Charge d’Affaires in Cambodia, Mr. Rafael Dochao Moreno, said that the community has strongly vowed to fight different the culture of impunity and crimes. The ECCC work in the last two years was processed under the strict monitoring of the donor community. However, what regrettable is the management of human resources in the ECCC. At the same time, the European Community also called for the monitoring on the accusation in order to use the finance correctly. The European Community is also satisfied with the most positive reports by the monitoring team. Nonetheless, the European Community asked for further efforts to promote the management of human resources. Meanwhile, the European Community declared to support the ECCC with both policy and finance. “According to the monitoring reports, after the evaluation at place within two weeks at the ECCC, the Project Council is pleased to announce that no essentially weak points were found, and the implementation of human resources at this stage meets acceptable standards. “The Sam Rainsy Party issued a statement on 24 April 2008 condemning Samdech Dekchor Hun Sen’s speech in Kratie of 22 April 2008 as a threat against voters. “The statement recalls Samdech Prime Minister Hun Sen’s speech, which said that there will be instability if the Cambodian People’s Party [CPP] looses power after the upcoming elections in July. The Sam Rainsy Party considered the speech to be a threat against voters, creating a bleak atmosphere in society. “Mr. Khieu Kanharith, the spokesperson of the royal government of Cambodia, said that Sam Rainsy has an ambition to divide the people according to stereotypes, while he has not yet power; his present ambitions are not different from Pol Pot’s ambitions. “Mr. Khieu Kanharith explained that Samdech Prime Minister Hun Sen’s speech in Kratie is just a response to Mr. Sam Rainsy, who tells citizens in different areas of the country that, if he wins the elections, he will take the land and property of the rich and give it to the poor, and he will replace old investors with new ones. These politics of Mr. Sam Rainsy, of removing the grass and its roots, will lead to instability in society if he wins the elections. “Samdech Prime Minister Hun Sen’s advisor Mr. Om Yentieng said that Sam Rainsy’s statement goes beyond the limit. The speech of Samdech Prime Minister Hun Sen is just describing a strategy that Samdech has seen, and he estimated its consequences. “Mr. Om Yentieng said that the CPP has never discriminated among the citizens, and the CPP is also the party that liberated the citizens from the brutal genocidal regime. “Sam Rainsy Party Deputy Secretary-General Ms. Mu Sochua said that the speech of Samdech Hun Sen in Kratie would frighten the voters. “She said that this serious speech of the head of the royal government is like a war warning. “She said that if other parties had made that speech, the CPP would have considered them to be agitators. “The Sam Rainsy Party stated that Prime Minister Mr. Hun Sen’s speech, during an inauguration of buildings in Kratie on 22 April 2008, saying that there will be instability if the CPP looses power after the upcoming elections in July, is a threat to voters, and it is also creating a bleak atmosphere in society; it contradicts the obligation and duty of the royal government to guarantee calmness in order to promote the political rights of voters before the election day. “Mr. Khieu Kanharith said that Sam Rainsy’s thought is that anyone who is not at his side will become his flesh-and-blood opponent. He divides people into stereotypes – those who support him are good, but those who do not support him are enemies. “Mr. Khieu Kanharith added that if Mr. Sam Rainsy is elected to lead the royal government, and then he starts to confiscate the property of the rich for the poor, or to remove old investors and replace them with new ones, there will be chaos in society. “Citizens who are rich are because of their hard work with their business. Therefore, if Sam Rainsy has the ambition to take their property for others, will they agree? Disagreement would lead to turmoil or to other reactions. “Mr. Khieu Kanharith stated that the CPP is a party that has led the government of the country since when the citizens had nothing, until they became richer and live with stability and peace in the country. “On Wednesday 23 April 2008, Samdech Dekchor Hun Sen, the Prime Minister of Cambodia, presided, as usual, over the 13th Government-Private Sector Forum, convened to provide outlook, strategies, measures, and high level decisions for implementation. “Senior Minister and Minister of the Economy and Finance Mr. Keat Chhon coordinated the forum. “The difference between the 13th Government-Private Sector Forum and previous forums was that, among all eight representatives of the Working Groups, not one person raised the questions directly to Samdech Dekchor Hun Sen. Senior Minister Mr. Keat Chhon raised the eight questions from the co-chairs of the Working Groups, and Samdech Dekchor Hun Sen responded, and presented his outlook and his strategies. “1.The Working Group on Agriculture and Agro-Industry (Group A) requested a decrease of customs tax, and an exemption from value added tax on goods imported for the agricultural sector. “Samdech Dekchor Hun Sen responded that he resolved this issue already and signed it, since 11 April 2008, in a sub-decree on the decrease of tax and the exemption from value added tax on goods imported for the agricultural sector. The tax rate on goods will drop to zero. The goods for the agricultural sector, for which the tax will decrease to zero, include simple truck replacement transporters, tractors, plowing machines, rice threshing machines, rice mills, incubators for hatching eggs, seed germination appliances, animal food, and materials for the production of animal food etc. Samdech Dekchor added that this is a measure to help investors in agriculture, and it supports also our farmers. “2. The Working Group on Tourism (Group B) requests the royal government to create a conference center or an exhibition facility in the city, to attract conferences of organizations or international exhibitions to Phnom Penh. “Samdech Dekchor provided an outlook for this request, saying the royal government does not have enough funds to construct a conference or exhibition center in Phnom Penh. This should be conducted by investment companies. Samdech said the construction of the CamKo Satellite City, the project of the GS Company (on the land of the former site of the theater that burned down), and the project to build a Novotel hotel – all these plans include the construction of conference centers, so this request should be solved with the private sector. “3. The Working Group on Manufacturing and Small and Medium Enterprises (Group C) requested encouragement for the local production and export of goods. Samdech Dekchor Hun Sen said that he made a decision on this request, together with the request from the agricultural sector, already on 11 April 2008. Samdech Dekchor stated that the royal government has already decided to decrease the tax rate to zero on some materials, on metal such as zinc, aluminum, copper, and nickel, and on some chemicals, and to decrease the tax rate from 35% to 7% for organic chemicals. “4. The Working Group on Law, Tax and Good Governance (Group D) requested to speed up the issuing of land titles, in order to use land titles as collateral for capital loans. “Samdech Dekchor said that he welcomes this request because it is reasonable. Samdech agreed that land titles can be used as mortgage for capital loans; they are not only for the safe holding of property, but they can be used when seeking capital from a bank. For this reason, the royal government welcomes this and promises to push the issuing of land titles. Samdech said that at present, 25,000 land titles are issued per month, and this will be increased to 30,000 per month, after some officials of the Ministry of Territorial Management, Urbanization and Construction will have finished their training. “5. The Working Group on Services, including Banking and Finance (Group E) requested the National Bank of Cambodia to increase the reserve capital that the commercial banks have to deposit with the National Bank form 8 to 16%. “6. The Working Group on Energy, Infrastructure, and Transport (Group F) requested to open offices for selling tickets to passengers and to buy insurance under agreements for the transportation across the Cambodian-Vietnamese border. “Samdech Dekchor Hun Sen advised to create a delegation to negotiate with the Ministry of Public Works and Transport, and to ask for the opening of such offices and sites for selling tickets for travel to Vietnam. To buy insurance requires a meeting to discuss this with the Ministry of Economy and Finance. “8. The Working Group on Industrial Relations (Group H) requested the royal government to create a law on trade unions, and a law to create labor courts. “Samdech Dekchor Hun Sen responded to this request that the Ministry of Labor must conduct further research to draft a law, discussing this with partners. As for labor courts, which have already been foreseen in the labor law, the Council of Legislative Reform or the Ministry must prepare the creation of such courts. “Samdech Akkak Moha Senapadei Dekchor Hun Sen said on 22 April 2008 that he wants to stop the use of royal language in the top national institutions in order to provide justice to all dignitaries in the use of the language for communication. “Samdech Prime Minister said during the inauguration ceremony of the library at Queen Kossomak High School in Kratie, ‘I also want to have the words “Preah Angk Mchas [“prince” or “princess” not used in the National Assembly, the Senate and the Royal Government, and also not “Toul Bangkum Chea Khnhom [“I” used in communication with members of the royal family], because the use of special royal language in the parliament makes its members already to be not equal.’ Samdech stated that we protect the monarchy, but those who enter politics should not have a different immunity from other people who also entered politics. “Samdech Prime Minister said with democracy in Cambodia, the politicians, when entering politics, cannot rely on themselves as the prince or princesses can…it should not be necessary to think whether you are a prince or princess. “Samdech Dekchor Hun Sen is a dignitary who brought back the constitutional monarchy in 1993 – after Field Marshal Mr. Lon Nol had dissolved it through the military coup in 1970 – and he always declares to protect the monarchy by claiming that the monarchy is for all Cambodian citizens, and it does not belong specifically more to some and not to others. “Samdech Dekchor said that some princes are respectable without entering politics, but some princes who enter politics must have the same rights as other politicians; when a prince hits us once, we must hit back twice to knock them down in order that they will never dare to do it again. Samdech said he used to give orders to princes who were members of the Royal Government, because they have to obey the Prime Minister’s orders. “While not mentioning the name, Samdech Dekchor Hun Sen called the accusation by Prince Norodom Ranariddh, who said that he cannot return to the country because of Samdech Hun Sen, an absolutely wrong accusation, and Samdech also called on Samdech Euv [the former King, the ‘Father King’] and on the King, to advise Prince Norodom Ranariddh. “Samdech Prime Minister said that the King and Preah Karuna – the father and a brother [of Prince Ranariddh] – to ‘help advise the son.’ This is not Hun Sen’s problem, but it is a problem of Prince Ranariddh himself [the latter is probably a direct quote – but not marked as such – from the Prime Minister’s speech]. “Norodom Ranariddh Party president Prince Norodom Ranariddh was sentenced by the Municipal Court in absentia to 18 months imprisonment, and he was fined in addition to pay US$150,000, accused of a break of confidence in the case of selling the Funcinpec headquarters in Phnom Penh, when he was the president of Funcinpec. “According to some sources, Prince Norodom Ranariddh said during the Khmer New Year, that Samdech Hun Sen had set three conditions for his return to the motherland – first, to write an apology to Samdech Hun Sen, second, to stop entering politics, and third, to return not to be the president of Funcinpec. “Samdech Prime Minister said that Samdech Euv and Samdech Mae [the former Queen] should tell Prince Norodom Ranariddh not to bother Samdech Prime Minister, so that Samdech Prime Minister has time to deal with economic issues, and with national security… and in case [Prince Ranariddh] needs anything in the future, he can depend on Samdech Prime Minister for it. “Separately, the Norodom Ranariddh Party spokesperson Mr. Mut Chantha told Kampuchea Thmey that what Samdech Krom Preah had said is all true and cannot be denied. “Deputy Prime Minister and Minister of Interior of the Royal Government of Cambodia Mr. Sar Kheng confirmed the vow of Cambodia for good cooperation with Interpol, especially for cooperation to fight fake medicines, while he visited the Interpol General Secretariat in Lyon, France, during the previous week. “Brigadier General Por Pheak, the chief of the Department of International Relations of the Ministry of Interior, said on 21 April 2008 that, on the occasion of staying in France form 12 to 19 April 2008, Deputy Prime Minister Sar Kheng met Interpol Secretary-General Mr. Ronald K. Noble, and he promised that he will fully support the cooperation between Interpol, the World Health Organization [WHO], and the World Customs Organization [WCO] by focusing on the manufacture and distribution of fake medicines all over Southeast Asia for the treatment of life-threatening diseases such as malaria and tuberculosis. “This project is supported by the International Medical Products Anti-Counterfeiting Task Force (IMPACT) with further participation by Interpol, the WHO, and the WCO, in collaboration with national police, customs officers, authorities concerned with public health, and health support organizations. Operations which target mainly the illegal trafficking [of medicines] in Southeast Asia will be created by Interpol and partners soon; this is the reason that the support also of Cambodia is very warmly welcome. “Cambodia also volunteered to host a meeting to support and coordinate the international cooperation against the manufacture and distribution of the fake medicines. “Cambodia has already shown its intention on the national level to protect its citizens from the danger of fake medicines by creating an office to control such crimes, and Cambodia welcomes to work together closely on the international level to fight the manufacture and distribution of fake medicines. “Brigadier General Por Pheak said that also other issues were discussed during the visit – including the support of Cambodia for the Operation VICO of Interpol towards the identification of a perpetrator who had committed sexual abuse against children, whose name had not been known. Through skillful work and efforts of the Cambodian police, also in cooperation with Cambodian citizens, Christopher Neil, the suspect of sexual abuses against children, has been identified [and arrested in Thailand]. “Deputy Prime Minister and Minister of Foreign Affairs Mr. Hor Namhong plans to sue Sam Rainsy Party president Mr. Sam Rainsy for linking him to the Khmer Rouge leadership. “Mr. Sin Bunthoeun, the chief of the Information Department of the Ministry of Foreign Affairs [and International Cooperation], said in the afternoon of 19 April 2008 that the Minister of Foreign Affairs Mr. Hor Namhong will prepare documents to sue Mr. Sam Rainsy for exaggerating the facts about him. Mr. Sin Bunthoeun said, ‘H.E. Hor Namhong is also a victim, and his two sisters who returned from France were detained in the Boeng Trabaek Prison and were later taken to be killed at Choeung Ek.’ Mr. Sin Bunthoeun said that Mr. Hor Namhong plans to hold a Buddhist ceremony to commemorate his two sisters soon. “The chief of the Information Department of the Ministry of Foreign Affairs does not know yet how much compensation Mr. Hor Namhong will demand from Mr. Sam Rainsy; he only said that Mr. Hor Namhong will meet his lawyer, Mr. Kar Savuth, on Monday and discuss it with him. “Mr. Hor Namhong has planned to sue Mr. Sam Rainsy after the opposition party president accused him on 17 April 2008 at the Choeung Ek Killing Fields Memorial in a Buddhist ceremony to commemorate victims of Khmer Rouge. Local newspapers quoted Mr. Sam Rainsy’s speech, which said that Mr. Hor Namhong was the chief of Boeng Trabaek Prison. He continued that to become the chief of the Boeng Trabaek Prison was not by chance, unless one was authorized by the Khmer Rouge. The chief of the prison was very powerful. Mr. Sam Rainsy also accused the Cambodian government of not wanting the trial of the [former] Khmer Rouge leaders to happen. He also used the occasion to push for the Khmer Rouge trials to be held soon. “In the afternoon of 19 April 2008, Rasmei Kampuchea tried to contact Mr. Sam Rainsy by phone but could not reach him. His assistant just responded that Mr. Sam Rainsy is at present in the United States of America, and he will return to Cambodia on 29 April 2008. At the beginning, I want to be personal. I edit the Mirror and the Kanhchok Sangkum as a foreigner – though as a foreigner who lives in Cambodia since 1990. Before, I spent also many years in other countries – 10 years in Japan, and extended periods of time in South Korea – apart from many visits to a number of countries in Africa and in Latin America. I always try to understand the context where I am. Friends in the countries where I spent longer time asked me: Don’t forget that we want to have your contributions as a friends from the outside – to deal only with our own views – we can do this ourselves; we want your critical opinion and comment, from your perspective, which may be different from ours. In Cambodia, I hear the same voices – but also the contrary: Don’t upset the situation by your questions – you should better know by now how things are handled in Cambodia. You will only isolate yourself. It is between these challenges that I try to share my reflections on what I see and do not see, reflected in the Khmer press, and in the international context of Cambodia. I appreciate the feedback I get, especially from some of our Cambodian readers – while some others whom I contacte, have cut communication. I am committed to continue this service as long as I see that there is response – and there is still even growing response – during the month of March 2008 we had 5,496 visits to the Mirror site (after one year), and 2,073 visits to the Kanhchok Sangkum site (after only two months of operation). This is the background of our work. From this background I share every week observations, questions, challenges in the editorials – well aware that I do it as foreigner, though as a foreigner who has has opted to be in Cambodia since many years. It is from this background that I am also asking questions which do not have easy answers, but need to get them, for the best of the society where we live – and where we live together in a globalized world. The headline of the article we mirrored on Friday caught my attention, that Mr. Sok Kong, the president of the Sokimex company and of other business enterprises, who was born from Vietnamese parents in Cambodia, boasts that he is proud of his background, saying, “Previously, I didn’t want anyone to know that I am Vietnamese for some reasons, but now it is different.” I first misunderstood the intention of the article. I took it as a sign that the Cambodian society is moving to treat the ethnic background of a person’s family as it is treated in many other countries which have overcome past ethnic and nationalistic self-isolation. I thought of the United States of America, where one of the three presidential candidates has the quite “foreign” name of Barack Obama, and I thought of the Italian parliamentary election last week, where for the first time a person of African parentage was elected into parliament. I remembered the names of public person in my own home country of Germany with such names as Asamoah (sport), Huseyin Aydin and Oskar LaFontaine (national assembly), Wischnewsky (secretary of state), and many others, who are German citizens. And the president of France has a Hungarian name from his father: Sarkozy, a Hungarian immigrant. They all took the citizenship of their present country where they play important roles; their names clearly identify that they have a former family background somewhere else. The article says that it is related to the concern of Khmer people about the presence of people of Vietnamese origin in Cambodia, about “spies all over Cambodia,” referring also to the rumor that “Yuon – Vietnamese – troops are interfering strongly both in the Khmer economy and in politics.” It would have been interesting to have any data presented. I am reminded when, during UNTAC time, the Khmer Rouge representative in the Supreme National Council also warned the UNTAC leadership about a Vietnamese military presence in the country. At that time UNTAC offered cars, ships, and helicopters to help to locate such Vietnamese soldiers – but after some frantic search, only one farmer, who had been a Vietnamese soldier during 1979 to 1989 and had married a Cambodian woman and had remained as a farmer, was identified. I might not have been so surprised about this, would here also have been similar concerns expressed in the Khmer press that three years after the “privatization” of the tourism administration of the Killing Fields Memorial in Choeung Ek to an unknown Japanese company (no address is known, also not to the Japanese embassy), it is not possible to publicly and transparently report what happened to the more than US$620,000 which were paid by the more than 300,000 reported visitors in 2006 and 2007. When the Cambodia Daily recently tried to get some clarity, they were given one phone number after another of some officials who would know – but everybody referred to another person in the round. The killing fields of Choeung Ek is also a symbol of Cambodian history, though different from Angkor. It is no surprise that recently, a group of Asian visitors, considered that the Khmer soul is being sold there, seeing the cheap and undignified commercialism at the Choeung Ek Memorial. The problems of being carried to quick and wrong conclusions in international relations, when a more careful evaluation of facts is called for before drawing conclusions, relates also to international marriages. 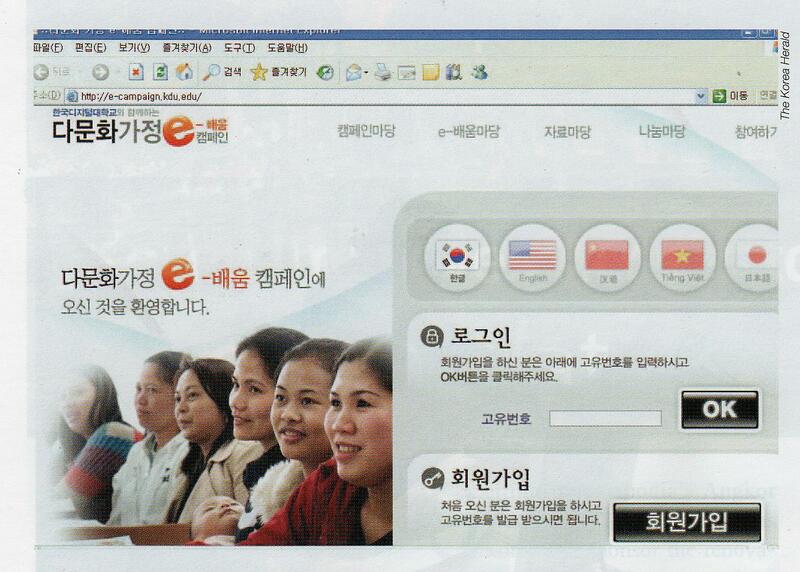 On 25 February 2008 we had reported that the licenses of two South Korean companies, seeking marriage partners, had been canceled in an attempt to prevent fake marriages. More recently, all legal documentation for Cambodian persons to marry a person of another nationality have been – temporarily – suspended, with the same reasoning. The planning of many families is suddenly disrupted; I know of a Cambodian man who cannot proceed with the paperwork to marry his foreign partner. Such voices have also to be heard, though this may be less popular. Such voices point towards confidence in a future, where nationality and culture will not be a reason of separation, but a challenge to build a richer human society. The ambassador said, “Efforts to overcome the differences of cultures and to solve misunderstandings in communication are to be of the highest priority.” The Korean side is starting to make such efforts. As about two percent of marriages in South Korea are international marriages, special programs are organized for immigrant marriage partners to assist them in the study of the Korean language and culture – and also different courses are set up for the Korean spouses and their families to learn about the culture from where the immigrant partners come. Almost 5,000 foreigners, mainly women, joined the Internet programs depicted below, and 16,000 workbooks have been given out. The challenge to be open is not only accepted in words, but in actual engagement, in a society opening up, a society which formerly was considered to have been very closed.